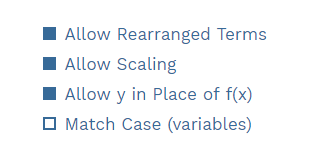 If you don’t want to accept y in place of f(x) you can deselect it. If you don’t want to accept X in place of x (we recommend not making it case sensitive since some keyboards automatically capitalize) you can select the “Match Case” option. Scaling lets you accept larger and smaller versions of equivalent equations. The prompt asks for the function to be written as f(x) but we decided to allow y as well for correct answers since if the student is getting this close, they are doing the math right and can get feedback later on which form to put it in. But wouldn’t providing this feedback be tedious and hard to scale to my 30+ students? The custom legend looks from the top down so it is important to have the correct answer first. If they did not account for the return bus fare, their response will show up blue on your dashboard. If you want them to have feedback about f(x) vs y without telling them they are wrong you can see who typed y in their answer (regardless of if they were correct) and remind them to pay attention to the prompt. If you want to praise students for getting close by correctly modeling the rate, you can see those responses in green. 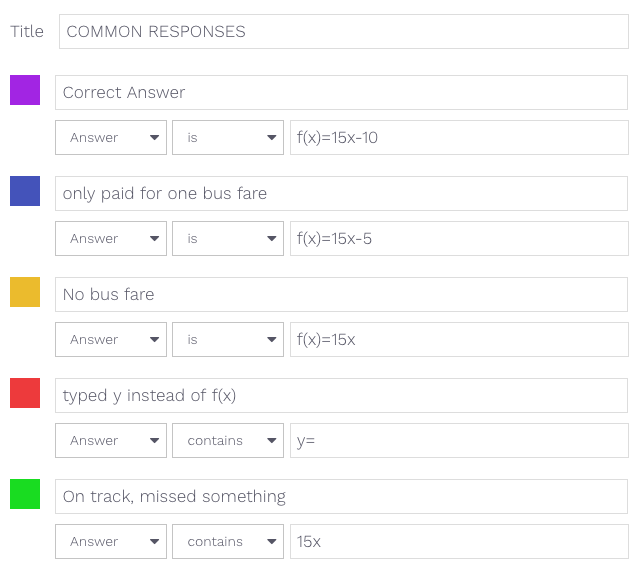 By automatically categorizing your responses, this task helps you provide more nuanced feedback and move your students learning forward. The next task has students model the same relationship but as a function of total hours, h instead of hours worked, x. In this case, h=x+2 so replacing x with h-2 will get you the correct answer. But wait! Isn’t f(h)=15h-40 equal to f(h)=15(h-2)-10? Yup! That’s why this task has no assigned correct answer. After students respond you can display the results and have them discuss (in groups if you want) what they all think the correct answer is. Also, if students finish early, you can ask them to find the other correct answer as a challenge. This task also provides an opportunity to review equivalence and distribution. In the third task, students model an old job where they made a commission of 20 per sale plus $10 per hour but are maxed out at $100 per day. This task, when combined with the next one gives them more opportunities to work on modeling and also adds some variables that take value judgements and let them connect their own out of class experiences. How hard is it to sell a bike? If you sold a lot, would it be worth it to go home early? How many hours a day do you want to work? The final task has them compute the convergence point of the two jobs. This gives them more data to address the question of if they should take the new job or not. There is no correct answer but you can expect student responses to pull in topics ranging from how many hours they want to work, if they like bus rides or not, if they had a car or carpooled if it would be shorter, and if they value having a higher wage more than convenience. We encourage you to modify this task and content to align it with similar content. You can copy the poll and modify or delete any task and also make new ones. Please reach out with any questions or comments, we’re here to support you! Get started by previewing the poll right now, or login to wootmath.com and search for the New Job poll in the Shared Gallery. Visit our page on Formative Assessment for more information on implementing these strategies in your classroom. Stay tuned for next week’s poll! This week’s math poll is a problem about a foot race between Amy and Spencer. The poll is aimed at getting students to think about multiple solution paths to this rates problem. The answer can be given in either distance or time for the head start. Also, feel free to discuss questions like acceleration time or assigning different start locations to make the race close. The first question accepts answers with or without units (we want to give more entry points for success, feedback on units can come separately). If you want to assess the units, feel free to modify the accepted answers or create a task that asks them what the units should be if the answer is 20. You can also review student work and praise someone for getting the right answer, then praise someone else for using the right units. This task also has a custom legend of common responses so if a student gets the number correct but spells the unit word wrong, they will be coded as blue (misspelled seconds but still had a 5 in their answer) or yellow (misspelled meters but still had a 20 in their answer). This can let you decide how important spelling is and distinguish spelling fluency from mathematical fluency. Better data means better feedback. The following table also presents some examples of student strategies for task 1. Student A has given the correct answer in meters, shown their work and used fractions to solve the problem. Student B has divided the distance by each rate to find the time for each to finish. Student C has done similarly but using s for Spencer’s time and a for Amy’s time. We encourage you to use the display student work feature to review examples in a whole class setting. This lets students see that they are not alone and that others can make similar errors or take different but also valid approaches to the same problem. The next task asks them to tap on the line that represents Spencer’s distance to the finish line over time. Answers close to the convergence point are not accepted because we want students to select an answer where we know which line they mean, not one answer that could be interpreted as multiple lines. This task also has the opportunity for you to discuss what would happen if you extend Amy’s line (the blue one) back to the y-intercept. 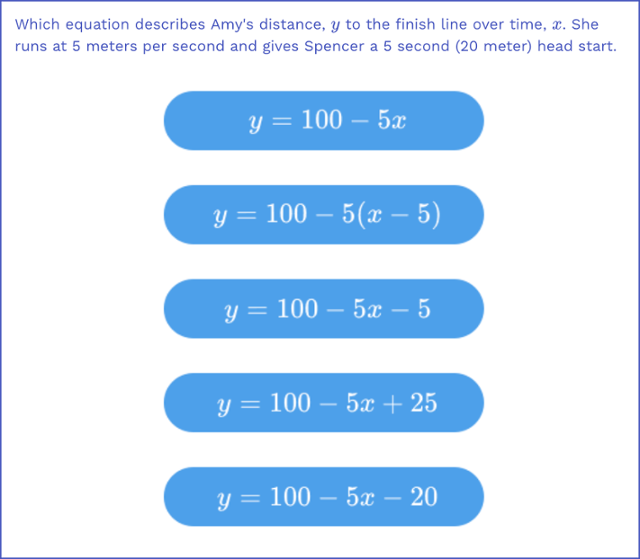 A great question for students who aced this: “If you want them to start at the same time how many meters from the finish line does Amy need to start?” Specify that this is not a head start, it actually means they run different distances so it is more of a handicap than a head start. The final task has two correct answers, B and D. This is designed as an opportunity for you do have a discussion about why they are both correct. 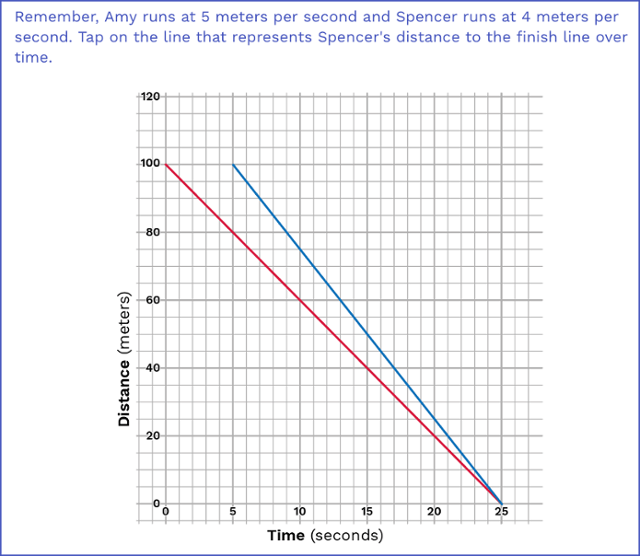 You can talk about how B represents a 5 second delay for Amy and how D represents a race where Amy has to run an extra 25 meters. 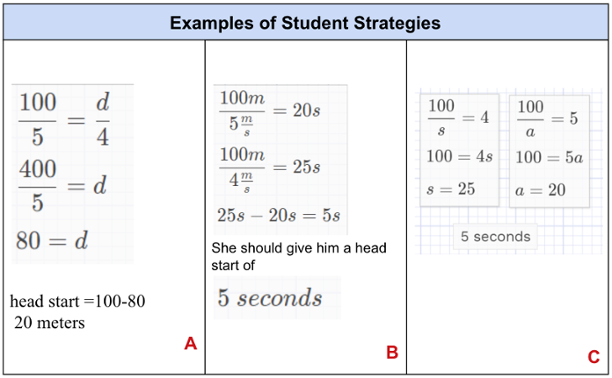 Students might choose E because of the head start of 20 meters or C because of the 5 second head start. If a student selects one correct answer, you can ask them to find the other correct answer. You can also present equation B as a horizontal transformation of equation A. This task also goes well with the grouping feature. You can create groups of 2-5 that are assigned randomly, homogeneously or heterogeneously based on correctness of the last response. For this task, students can discuss why they chose the equation they did and hear the perspective of others. If you want a re-vote, simply duplicate this task and they can take it over again after discussion. We encourage you to modify this task and content to align it with similar content. You can copy the poll and modify or delete any task and also make new ones. Please reach out with any questions or comments, we’re here to support you! Get started by previewing the poll right now, or login to wootmath.com and search for the Head Start poll in the Shared Gallery. Visit our page on Formative Assessment for more information on implementing these strategies in your classroom. Stay tuned for next week’s poll! Wiliam, D., & Thompson, M. (2008). Integrating assessment with instruction: What will it take to make it work? Future of assessment: Shaping teaching and learning.